If it is a little girl's party, why not make it a Pink Castle? Our Pink Castle bounce is a very attractive ride that is sure to excite every little girl. Everyone can enjoy this 13'x13' Pink Castle as a great source of fun and even exercise.. Up to eight riders can enjoy the Pink Castle at once. 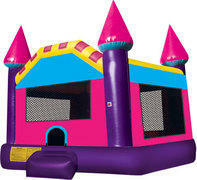 Everyone is sure to enjoy a classic bounce house at any event, and the Pink Castle is a great item to offer.